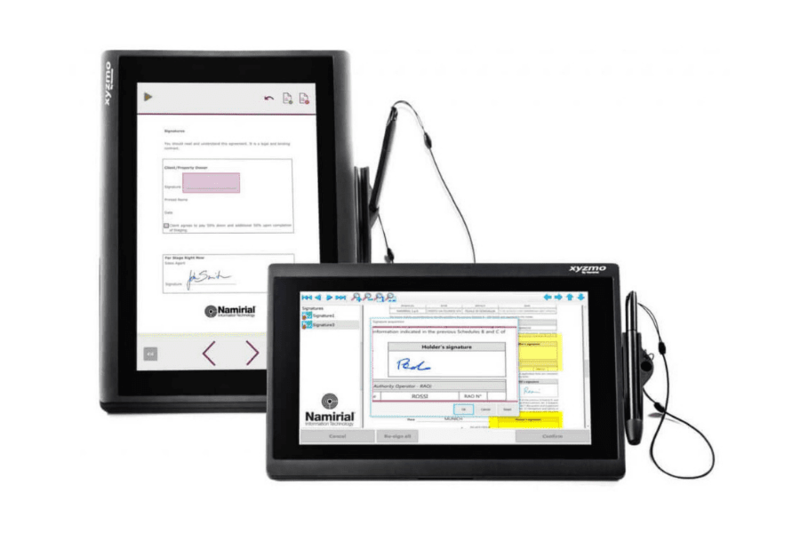 April 24, 2018 – Senigallia, Italy / Belgrade, Serbia – Namirial, leading provider of Digital Transaction Management (DTM) software and specialist for digital handwritten signature software installed on more than 375.000 workplaces worldwide, announced today the general availability of Namirial pads NT 10011 and NT 10012 for reading, completing and signing documents on screen with a signing experience as close to paper as possible. The new Namirial pads can be seen and tested at Technobank banking conference in Belgrade today and tomorrow at booth of Namirial partner ITSistemi. The devices are designed for all locations where digital signatures meet digital signage: when not in use for signing, organizations can advertise their services via images and videos. While NT 10011 is a classic stylus-operated signature pad, NT 10012 comes with touchscreen capabilities. Both are designed to support digital transformation at the POS in banking, telco, retail, public services and health services and offer outstanding value for money. These new 10.1-inch screen signature pads complement the broad range of signature pads and pen displays of various sizes sold and supported by Namirial – in particular Wacom pads, as well as a broad range of tablets and smartphones. Namirial is offering the broadest device support for handwritten biometric signature capturing including the option for automatic signature verification for data captured using various device types, all officially certified in its labs. Namirial pads also carry the Xyzmo trademark, reflecting the heritage trademark of the 2015 acquired Austrian company with the same name. Shipment of new Namirial signature pads will start in August 2018. Namirial is a global leader in trusted security for Digital Transaction Management with solutions for user electronic identification, multi-factor authentication, digital certificates, electronic signature, electronic invoicing, and digital archiving. The company has been certified for many products and services including as an eIDAS Qualified Trust Service Provider. Namirial employs more than 350 people and is processing several millions of transactions every day. In addition to offices throughout Italy the Namirial group runs subsidiaries in Austria, Brazil, Germany and Romania. Visit our website namirial.com or follow us on LinkedIn and Facebook. Signature pads and other devices officially certified in Namirial labs for handwritten biometric signature capturing including option for automatic signature verification.